About the Children's Department: Take a Moment to - Reflect! Take a Moment to - Reflect! Yesterday I wrote, "The Summer is over and Fall ministries are beginning, so now is the perfect time to take a moment to pause, reflect, evaluate, and give Thanks! ", and then took time to consider pausing. 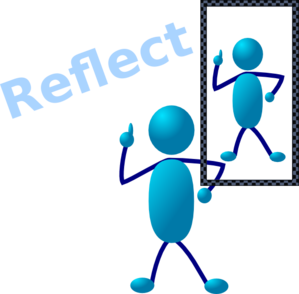 Today I want to take a moment to consider what it means to "reflect" and why we should do so, but first; let's think about what "reflect" means. I looked on-line and found the following synonyms for "reflect" . . . "chew over; think over; meditate; mull; mull over; muse; ponder; ruminate; reflect; speculate; contemplate". So, with these in mind, let's think about taking a moment to "reflect" . . .
As you "reflect" or "chew over", "think over", ponder or contemplate the past three months, what did you do which you are really happy with? What went the way you wanted it to - for the most part? What did you do over the summer which you want to be sure to do again in the Summer of 2015? What did you do which you can continue or build on through the Fall? What did not go the way you wanted it to? What did you do over the summer which you do not want to repeat in the Summer of 2015? If you are not going to repeat something you did, what will you do to replace it for Summer 2015? What do you wish you had tried? Is there something new you think you might like to try for Summer 2015? Reflecting is all about evaluating and if we do not evaluate the things we do, how will we know if we are "on target" or just throwing everything at the wall hoping something "sticks"? Take time this week to reflect, chew over, think over, ponder and contemplate . . . and be sure to take notes!